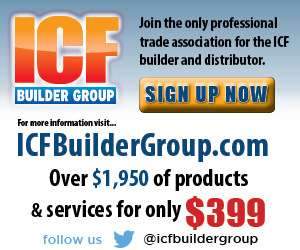 Big, complex ICF projects are becoming increasingly common. 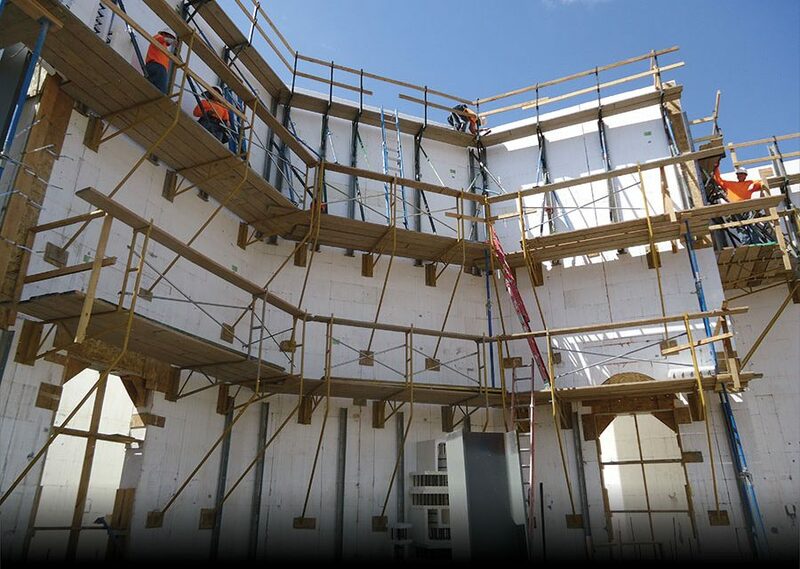 These jobs frequently feature tall walls with multiple penetrations, wall heights, and corners that can challenge the skills of the most experienced ICF installer. Additionally, safety standards and inspections on these large heavy commercial projects are far more stringent than on residential jobs. 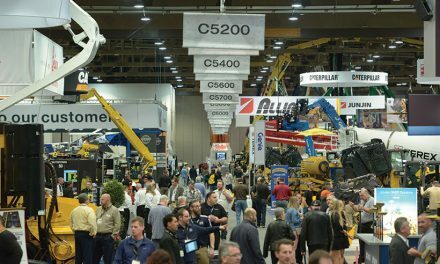 Finally, many jobsites have little room for staging material, and extremely tight schedules. 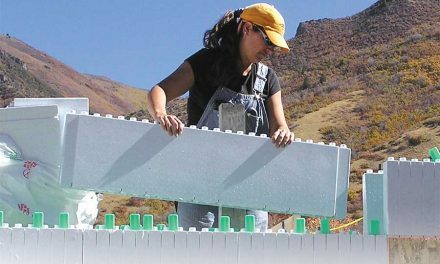 Fortunately, new bracing options make it possible to create walls that are perfectly plumb and square, more quickly, easily, and safely than in the past. 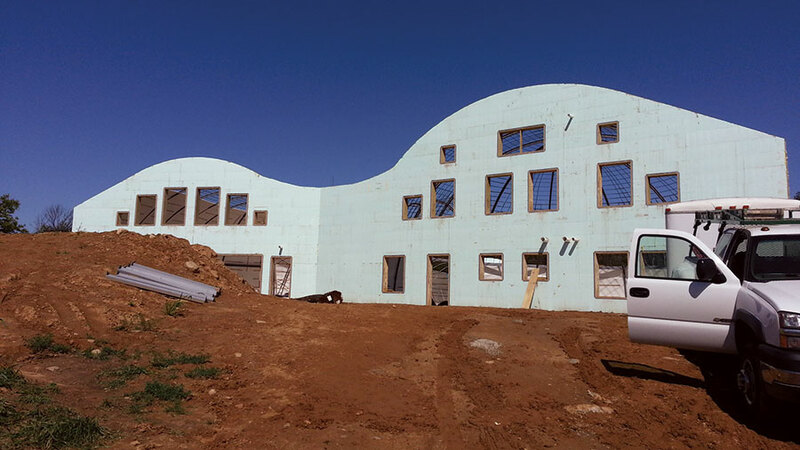 With barrel- and dome-shaped roofs, multiple closely spaced windows and tall walls, this Michigan job was a bracing challenge. It was successfully poured using turnbuckle bracing. Tall walls without intermediate flooring is one common challenge. Jake Vierzen (see company profile on previous page) encountered a project with 20-foot walls, an undulating roofline, and multiple, closely spaced windows. He successfully braced and poured the walls using regular and tall-wall turnbuckle bracing braced off the ground. 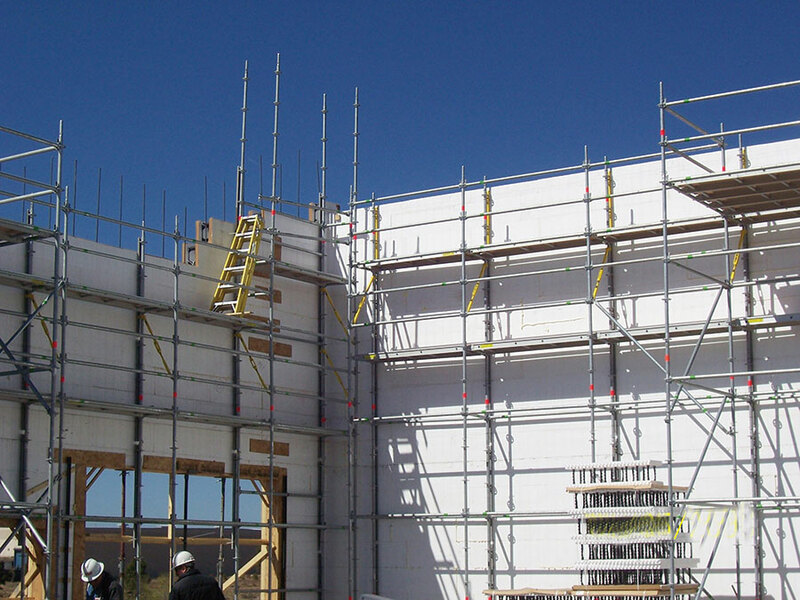 For convenience and speed, Plumwall’s innovative bracing systems can be adjusted with a cordless drill from atop the scaffolding, a feature that becomes increasingly valuable as wall heights increase. For walls taller than 25 feet, though, turnbuckle bracing is usually no longer an option. 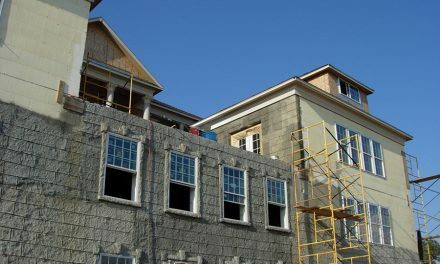 Crank-up masonry can be adapted for ICF work. 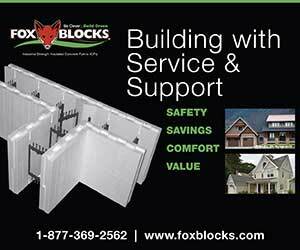 Uniscaffold is a bracing system designed specifically for ICF tall walls. 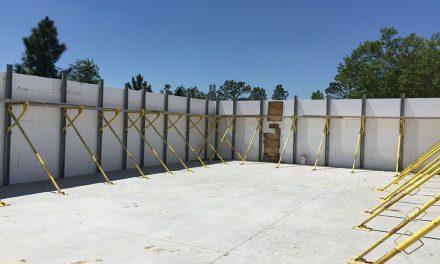 According to Al Peterson, who developed the system and now works for Logix, it speeds construction, and allows material to be staged no further than 17 feet from the installer, no matter the scale of the project. It goes up fast and meets the latest OSHA guardrail requirements. The system is also unique in that it clips to the wall itself, instead of being fastened with screws to a furring strip. So instead of a pull strength of 80 pounds per screw, Uniscaffold is rated at 260 pounds per bracket. Whatever system is chosen, guardrails are essential. About 18 months ago, the U.S. Occupational Safety and Heath Administration (OSHA) issued new, more stringent rules for protecting residential construction workers from falls. Basically, all workers more than six feet above the ground are required to have some sort of fall protection (roof tethers, guardrails, safety nets, etc.) In California and on military projects, the requirements are even stricter. Tethers and harnesses interfere with work, and nets are impractical, so guardrails are industry standard. A system that allows easy movement and access to materials while providing an OSHA-compliant guardrail is essential. Uniscaffold clips to the wall itself, instead of being fastened to furring strips, and includes integral guard rails. It is most popular on jobs with wall heights exceeding 25 feet. With any construction project, time is money. On large commercial jobs, that sometimes means multiple trades working in the same area at the same time. Rod Fetters, of ICF Specialist, faced that exact situation when building the Newman Center on the Arizona State University campus. With little room and many other trades working on site, material storage and bracing was a tremendous challenge. Walls reached 40 feet high, so turnbuckle bracing wasn’t feasible, and scaffolding didn’t allow trades to work on the wall below. So, Fetters invented his own tall-wall bracing system that—instead of fastening to the floor—fastens to the lower section of the already completed wall. 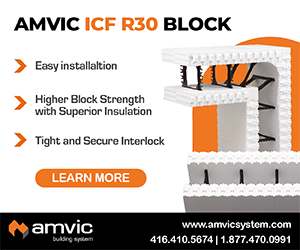 The patent-pending design, based on a modified Giraffe brace system, allows the trades to work unobstructed directly below the scaffolding while the ICF work continues to go vertical.